Veteran lightweight Melvin Guillard (pictured) was unemployed for 17 whole days. Guillard has signed a multi-bout agreement with World Series of Fighting. As customary with MMA contracts, terms of the deal were not disclosed. 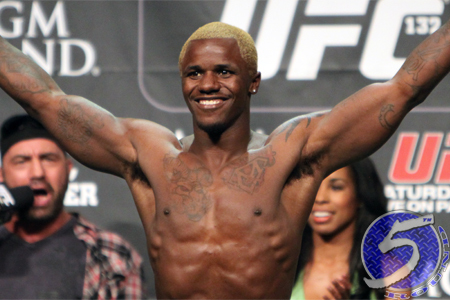 Guillard was released from the UFC last month after his lackluster unanimous decision defeat to Michael Johnson. “The Young Assassin” emerged onto the UFC scene as a contestant on “The Ultimate Fighter 2″ back in November 2005. Guillard had a roller coaster career in the UFC, which lead to his one-fight departure after losing to Rich Clementi in 2007. Guillard’s best run started in early 2010 when he rattled off five straight wins, finishing off three of those victims in devastating fashion. A UFC lightweight title bout appeared to be on the horizon, but he inexplicably embarked on a 2-5 (1 NC) skid. The 31-year-old owns an extensive 31-13-2 (2 NC) overall professional record. Guillard is expected to make his WSOF debut this summer.